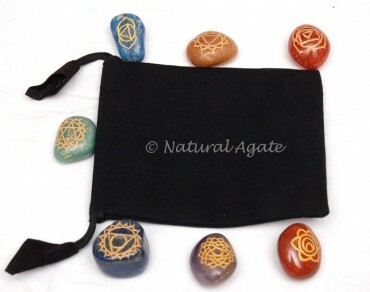 Chakra Engraved Tumbled Set includes seven chakra stones. These tumbled chakra stones have symbols of body chakras engraved, gold-painted on them. Keep these stones on the respective body parts where body chakras are located to pass the energy to them. Check Natural Agate site for more chakra sets.